Innovative Automation is a leading source for pneumatic parts and devices. Pneumatic devices utilize pressurized air to create linear or rotary motion. Compressed air is distributed through electromechanical valves and into components such as linear or rotary actuators, grippers, vacuum generators, or hand tools. Innovative Automation is a leading provider for Omron and other manufacturer sensors. Our customers demand it. Sensors, Vision, and Feedback Devices can be thought of as the “eyes and ears” of industrial automation. External sensors collect data from the system, such as presence, position, distance, color, text data, and quality control information. This data is fed into control devices, such as PLC’s or motion controllers, for processing. Although similar in function to many Safety products, these products do not meet the guidelines for preventing injury to life or limb. A few weeks back, Innovative Automation‘s Lonnie Muse was rear-ended in a traffic accident. All I can say is this is one hellacious of a way to generate sales leads. This is a bit out of the ordinary contact attempt but our Administrative Assistant-Jennifer XXXXXX was involved in an unfortunate accident with you several weeks ago and had mentioned what your company does and recently gave me your card. We just simply wanted to make ourselves available to you and your company as a potential vendor of XXXXXX products to assist in your customer’s needs. We have several programs ranging from a true sub-distributor to a simple finder’s fee. Please review the attached literature at your convenience to see if you see a potential fit and call or write with any questions you may have. We appreciate the opportunity! 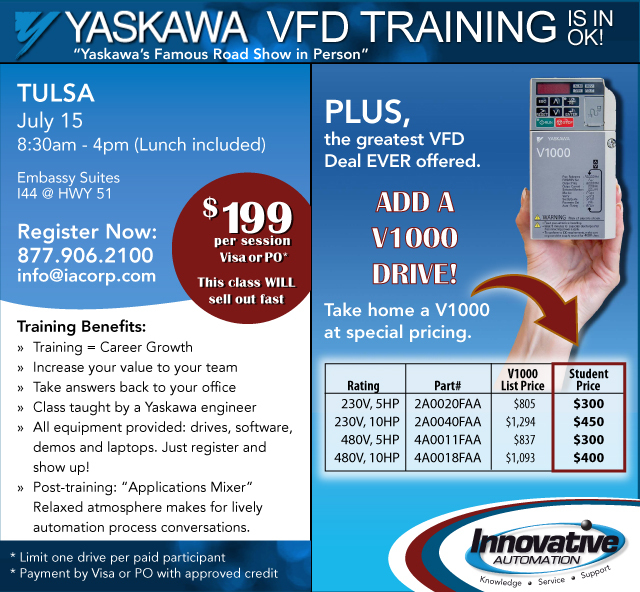 The Yaskawa VFD Training road show arrives in Tulsa, Oklahoma, July 15. Brought to you by Innovative Automation, the HOME of LEGENDARY customer service. Don’t believe it? Try us. Innovative Automation is an expert in motion control. If you have a factory anywhere in the country, Innovative Automation can help reduce your bottlenecks and inefficiencies. Just like using Parker Motion Control. C’mon, let’s get started working together. Motoman Inc. and Yaskawa Electric America, Inc. announced June 1 that they will combine to form Yaskawa America, Inc. The Motoman Inc. operations, headquartered in Dayton, Ohio, will form the Motoman Robotics Division of Yaskawa America; the Yaskawa Electric America, Inc. operations, headquartered in Waukegan, Illinois, will form the Drives & Motion Division. According to Yaskawa America, Inc. Chairman and CEO, Gen Kudo, the new name will allow the company to fully exploit Yaskawa’s position as the world’s largest manufacturer of AC drives, motion control products and industrial robots. Innovative Automation is a leading distributor for Yaskawa VFDs and motion control products. Innovative Automation has added to its training class schedule for 2010. Please note that Yaskawa Drives Roadshow has been added to Tulsa for July 15. There could be more classes added later so please check back at http://www.iacorp.com or email info@iacorp.com for more information about training classes in your area.